In all the existing plans for running high speed rail up the peninsula to San Francisco, the additional pair of tracks required for HSR traffic is invariably shown in the center of the right of way, with Caltrain local service running on the outside pair of tracks. The typical Caltrain station would still have two outside platforms, except there would now be four tracks through the station, like the existing Bayshore and Lawrence stations. 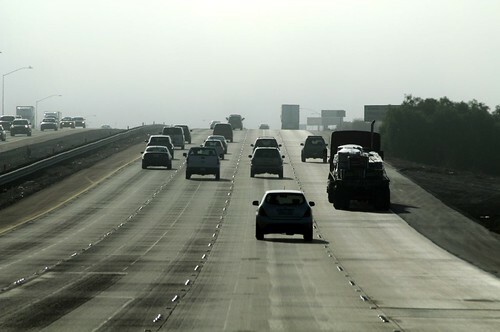 Intuitively, it's easy to accept this configuration without questioning it for even a second, because we are all familiar with freeways, where slower traffic keeps right and faster traffic passes on the left. (photo credit: mojoey) That paradigm is so deeply ingrained in our minds that we tend to think high speed trains should obviously operate the same way, right? Not so fast-- with nearly every Caltrain station from San Jose to San Francisco about to be totally redesigned from a blank sheet of paper, it's worthwhile to question all assumptions, and in particular the assumption that HSR should run on the inside pair of tracks, i.e. slow-fast-fast-slow when enumerating the tracks from one side to the other. (Credit to Richard M for raising most of the following ideas in previous comments). What if Caltrain local service ran on the center pair of tracks, with HSR and express trains on the outside tracks, i.e. fast-slow-slow-fast? What would be the pros and cons of each approach? For HSR? For Caltrain? For communities abutting the tracks? 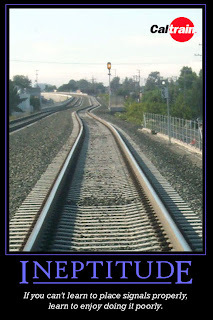 Anyone who commutes on Caltrain knows that periodically, an incident occurs that puts one track out of service for a few hours. While it is tempting to ascribe this to grade crossing accidents and equipment breakdowns, both of which would be alleviated by electrification and grade separation, the fact remains that service disruptions can and will happen on occasion. When one track for local commuter trains is shut down, service is typically cut over to the other commuter track for a short stretch around the incident area. Caltrain has the option of switching tracks at over a dozen crossovers, spaced every few miles along the peninsula. Trains can temporarily run the "wrong" way and make their usual station stops on the other platform track. To the extent possible, this minimizes delays and inconvenience to passengers. With HSR in the mix, it gets more complicated. If HSR runs down the middle pair of tracks, cutting over local commuter trains from one platform track to the other platform track requires crossing over both HSR tracks and thus waiting for, or delaying, traffic on those center tracks. Temporarily running on the "wrong" platform track would involve a complex, coordinated sequence of moves that disrupt service on all four tracks. In addition, waiting passengers would have to dash to the opposite platform in order to catch their train. If HSR ran on the outside pair of tracks and Caltrain commuter service on the inside pair, a disruption on one of the commuter tracks would not conflict with HSR service. To switch to the other platform track, locals would simply cross over to the adjacent commuter track. Under this scenario, Caltrain stations would have a single island platform in the middle of the right of way, located between the center pair of tracks. Passengers would not have to switch platforms to catch their train on the other platform track, since the platform tracks would serve each side of the same platform. What happens if instead, one of the express tracks is disrupted? It's not nearly as bad: a train can simply be routed to the adjacent track. Unlike local service, platform access is not required for HSR and Caltrain express services, which would stop only at key stations with four (rather than two) platform tracks. Therefore, the requirement to switch to the other platform track does not apply; any track will do. In short, the fast-slow-slow-fast track configuration provides great flexibility for dealing with service disruptions on any given track. On the other hand, the slow-fast-fast-slow configuration causes a big mess that disrupts all four tracks, whenever one of the local tracks is knocked out of service. One other interesting fact is that in certain locations along the peninsula, Caltrain service could theoretically run in both directions on a single track without trains ever conflicting with each other. (Hello Atherton! Take note!) This naturally depends on the density and scheduling of Caltrain traffic, but it opens up the possibility of having only three tracks in certain locations, as dictated by the operational service pattern (Hello Atherton! Service pattern, not your back yards!) Switching to a three-track configuration from a four-track configuration is much simpler if you go from fast-slow-slow-fast (4) to fast-bidirectional-fast (3)... a simple turnout, and presto. On the other hand, trying to neck down from slow-fast-fast-slow (4) to any combination of 3 tracks invariably requires expensive flyovers to avoid frequent fouling of HSR traffic by local trains. The option of turning some commuter service back in the other direction before reaching either end of the line provides additional flexibility to tailor service patterns to passenger demand. This falls under the broad umbrella of operational flexibility, but merits a brief mention. For example, some Caltrain service could be turned back at Mountain View, heading back north where most of the ridership demand currently exists. Similarly, future Fremont service could be turned back at Redwood City. When a train is turned back, it needs to switch from one local track to the other local track. In a slow-fast-fast-slow configuration, this move requires fouling all four tracks in both directions. The fast-slow-slow-fast configuration, on the other hand, allows turnback tail tracks to be placed in the center of the right of way between the local tracks, with turnback moves having zero operational impact on any other track. For the slow-fast-fast-slow track configuration, commuter (Caltrain local) stations would have two outside platforms, like the existing Bayshore and Lawrence stations. For the fast-slow-slow-fast configuration, commuter stations would have a single island platform, like the existing Belmont station. A single platform has several advantages for passengers: there is no choice of which platform to use, making station access less confusing. A single platform is more pleasant, because it is typically about 30 feet wide rather than 15 feet. It is safer, because there are fewer opportunities to be isolated from other people. It is cheaper to provide all the station amenities, such as benches, shelters, ticket vending machines, elevators, information signs, platform lighting, etc. since they are shared for both service directions. 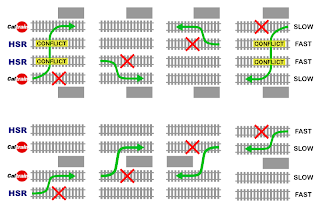 On stretches of track between stations, both track configurations require about the same amount of land. The fast-slow-slow-fast configuration puts high speed traffic 15 to 20 feet closer to abutters' back fences. Whether this makes a material difference to noise levels remains to be evaluated, since high speed trains are generally quieter than any other train type at speeds of just 125 mph. The fast-slow-slow-fast configuration also requires more land for the approaches to commuter stations, because the outside fast tracks must slew aside to clear the center platform in the station. On tracks built for 150 mph operation, tracks can be slewed by the necessary amount (about 15 feet) in a run length of about 1200 feet before and after the platform itself. These dimensions require an extra four triangular strips of land, 15 x 1200 feet, at each of four corners of the station area; in total, just shy of 1 acre. In a slow-fast-fast-slow track configuration, HSR trains would run straight down the peninsula without care for Caltrain infrastructure. In the alternate scenario with fast-slow-slow-fast island platforms, HSR must jog around each and every one of about twenty Caltrain station platforms. However, comfort for HSR passengers would not be adversely impacted even with the somewhat frequent twisting and turning of the high speed tracks. The key to comfort in curves is managing the lateral acceleration and its time derivative (also known as "jerk"), and the dimensions mentioned above account for suitably benign track geometry. Union Pacific runs freight trains over Caltrain's peninsula tracks, to serve various industrial customers as far north as the port of San Francisco. There are roughly two round trips per night. Service to industrial branch lines could continue essentially unchanged under the slow-fast-fast-slow track configuration. If the local tracks were moved to the center for a fast-slow-slow-fast configuration, the occasional freight train would have to cross over the outside HSR track to reach the customer. Given the massive difference in axle loading and speed, it is unlikely that running freight trains over any HSR tracks would even be feasible. HSR on the peninsula will require the vast majority of Caltrain improvements made in the last decade to be demolished and rebuilt. Dozens of platforms, buildings, etc. will have to be moved to make way for four tracks. However, Caltrain has two stations, Lawrence and Bayshore, which could be used essentially as-is for slow-fast-fast-slow operations. Converting these two stations to fast-slow-slow-fast would require demolishing and rebuilding the platforms, modifying the pedestrian access, and realigning the tracks. On the other hand, the Belmont station is in the opposite situation: it could be used as-is for fast-slow-slow-fast operations, but would have to be entirely rebuilt for slow-fast-fast-slow. Whatever approach is chosen, there will be nearly total reconstruction of every Caltrain station, and the issues with Bayshore, Lawrence and Belmont will be lost in the noise. Commuter stops that are added at a future date, as development fills in around the tracks, are termed infill stations. With a slow-fast-fast-slow configuration, they are easy to build by simply adding a pair of outside platforms and suitable pedestrian under/overpasses. With fast-slow-slow-fast, realignment of all four tracks is necessary to provide clearance for the new central island platform. Communities along the Caltrain right of way are already well developed, so future infill stations are unlikely to be numerous. To pull together all these pros and cons, it is useful to pause first and remember that Caltrain's most valuable asset is its land. As such, HSR ought to be considered a tenant on Caltrain's property, which means giving proper consideration to Caltrain's need to provide effective commuter service. That is why operational flexibility should be weighted heavily. Putting all the factors together in a table, and assigning weights, one can build a trade study to identify the optimal solution. The nice thing about a trade study table is that arguments about the best solution can be reduced to arguments about the factors, and the weights assigned to each. One can quibble with the weights assigned to each factor, but the conclusion seems pretty emphatic: the Caltrain tracks should be placed in the center, flanked by HSR on the outside. In short, Slow Traffic Keep Left! Palo Alto was founded in 1887, several decades after the railroad tracks were first laid between San Francisco and San Jose. The town grew and filled in around the railroad tracks, and now has one of the busiest stations on the Caltrain line (shown at right; credit cdent), second only to San Francisco. Palo Alto today handles nearly 50% more riders than San Jose's Diridon Station, vaunted as tomorrow's "Grand Central of the West." Palo Alto is also a major stopping and transfer point for Caltrain's Baby Bullet express trains. That is why Palo Alto, along with Redwood City, is under consideration by the CHSRA as the possible location for a mid-peninsula high speed rail station. Whether or not this new station is located in Palo Alto, the CHSRA's choice of the Pacheco Pass alignment via San Jose means that high speed trains will run through the town along the Caltrain right of way, which will be widened to four tracks and electrified. The Palo Alto Ave. (a.k.a. Alma) crossing right after the bridge would become an underpass, and perhaps not an easy one to build considering the proximity of the San Francisquito aquifer. The right of way is 100 to 120 ft wide in the area of the creek crossing (see ROW map), leaving plenty of room for four tracks. The existing Palo Alto depot, with its distinctive "Streamline Moderne" style, was opened in 1941. It is the third depot building that has existed at this location. The station once had three tracks running through it; today, the middle track has been dismantled, leaving a wide space between the two platforms. The platforms and pedestrian underpass were recently renovated by Caltrain, as part of a $35 million improvement project. The impact of high speed rail on the Palo Alto station area will depend on whether or not the town becomes the mid-peninsula HSR stop. However, regardless of this outcome, the station area will require some reconfiguration to accommodate high speed trains passing through the station at speeds of 125 mph (200 km/h), as planned by the CHSRA. The existing 1940s station, along with the underpass for the town's main street, University Avenue, were built alongside the tracks that previously existed there, presumably to allow uninterrupted service during construction. As a result, the entire station is offset laterally to the west of the straight alignment of the peninsula tracks; the northbound track is offset by 60 feet, and the southbound track by 85 feet (shown in the photo at right by ibison4). While this arrangement is fine for the speeds practiced today, it will look like a chicane to an approaching high speed train. At speeds of 125 to 150 mph (200 to 240 km/h), curves must have radii of at least 1 to 1.5 miles (1800 to 2300 m), with adequate spiral easements entering and leaving each curve. While there is enough room to run such curves through the present footprint of the Palo Alto station (see map below for approximate property limits), it will require a total reconfiguration of the tracks through the station. At 150 mph, the maximum lateral track offset comfortably achievable within a run of 1500 ft (about the room available on each end of the existing station) is about 20 ft. At 125 mph, it is about 30 ft. Both of these values are much lower than the present lateral offset of 85 ft (on the southbound track), which would require a train to slow to about 85 mph (135 km/h). It may seem easy to slow down a bit through Palo Alto, but it would cost about a minute (over half a percent) on the overall SF - LA run times. If every trouble spot from San Francisco to Los Angeles cost a minute, HSR would never be possible; therefore, just like San Bruno's sharp curve, today's Palo Alto station alignment should be considered a serious obstacle to HSR on the peninsula. To reconfigure the station for higher speeds, it is possible to (a) straighten the station by shifting the tracks closer to their ancestral straight-through alignment, as depicted in an effortless hand sketch in the CHSRA's "station fact sheet", or (b) make the tracks bow out westward on a smooth and continuous curve, which requires building gently curved platforms. Due to the overall width required for four tracks and two platforms, parking will need to be moved elsewhere from the east side of the station, and the Alma St. overpass that runs parallel to the tracks will need to be completely reconfigured. (This overpass, as it exists today, is built on railroad land.) The existing northbound platform would have to be demolished; however, the money recently spent to rebuild it is but a drop in the HSR bucket. With the track alignment issue taken into consideration, there are basically two scenarios for the Palo Alto station area, where railroad land is abundant (see ROW map). If Palo Alto chooses to become the mid-peninsula stop for high speed rail, the impact to the station area will obviously be greater. However, an expanded station would also create opportunities for more frequent and efficient Caltrain service, in addition to long-distance HSR service. It would become possible to operate timed, cross-platform connections between Caltrain local and express trains. 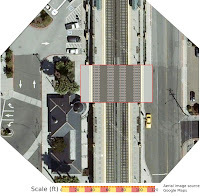 The CHSRA shows in its station fact sheet that Palo Alto would be rebuilt with two island platforms located between the inner and outer pair of tracks, a configuration that is favorable to cross-platform transfers. One is left to wonder why this configuration was not chosen for Millbrae as well. The basic cross-sectional dimensions from this station fact sheet are reproduced in the map below, with curved tracks bowing out such that the curve apex coincides with today's southbound track. The two island platforms are curved as well, but their radius of 3.5 miles (yes, miles!) might as well be straight for purposes of platform boarding and alighting. A more accurate version of this map is also available by downloading the original KML file into Google Earth. Note that if the existing depot building were demolished or moved, it would in principle be possible to shift the curve apex a further 15 meters (50 feet) west of the existing southbound track, possibly relieving some of the design constraints on the Alma / University road overpass. The station would require a new parking garage, with easy access from El Camino Real. The nearby El Camino Park would not be affected. If the mid-peninsula HSR station is built in Redwood City instead of Palo Alto, the station would be expanded to four tracks flanked by two outside platforms, with no platforms on the center high-speed tracks. Since there is only enough room for three tracks through the existing station, the northbound platform would most likely be moved (i.e. demolished and rebuilt), providing room to straighten the center express tracks and add the fourth track. No matter what happens at the Palo Alto station, expect a big rearrangement on the east side of the station, with serious impact to the Alma St / University Ave overpass. Given that major reconstruction will be required either way, Palo Alto ought to give serious consideration to "biting the bullet" and building the HSR station. An existing bike path along the west side of the tracks, from the Palo Alto Medical Foundation to the Churchill Ave. crossing, is partially built on a revocable easement of Caltrain land (see ROW map). Widening to four tracks will require the bike path to be removed from this location. The existing bike tunnel would also have to be reconfigured. From approximately this location until California Avenue, the Caltrain right of way is narrower than 100 feet. From the station to Churchill Ave, the ROW is 85 feet wide. The CHSRA plans a split grade separation for the existing Churchill Ave grade crossing, located behind Palo Alto High School. Refer to Volume 2, Appendix D, page 5 of the Bay Area EIR/EIS. The preliminary concept for this split grade separation would raise the tracks by 15 feet (4.6 m) on a retained embankment (i.e. an embankment with vertical walls) to pass over Churchill Ave, with the latter lowered by about 6 feet (1.8 m). It is difficult to lower Churchill further due to the proximity of the intersection with Alma St.; the impact of lowering the intersection must be traded off with the impact of the retained embankment. Due to constraints on the vertical curvature of the tracks for planned operation at 100-150 mph, the approaches for a 15-foot raised embankment would necessarily be long, on the order of 400 m (1/4 mile) on each side of the overpass. Shorter approaches would make passengers feel uncomfortable as the train crested over the top. This is why the area behind Palo Alto High School as well as a good portion of Southgate would be affected by the long Churchill grade separation embankment described in the CHSRA's documents (although the 3% ramps described in Volume 2 Appendix D are not feasible). Architect and local resident Jim McFall has produced video renderings of what this grade separation might look like, although he modeled it a full 21 feet higher, rather than the 15 feet assumed in CHSRA documents. It is likely that Churchill could be depressed ~6 feet from the current track level. Southgate is a neighborhood that abuts the western edge of the tracks, just south of the Churchill Ave crossing. This area is one the narrowest portions of the railroad right of way owned by Caltrain (see ROW map). 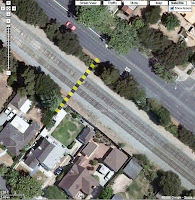 The overhead view at right, superimposed with a scale ruler, shows about 75 feet of horizontal clearance between the back fences of houses on Mariposa Street and the Alma Street curb on the other side of the tracks. Eminent domain takings, even for as little as 10 feet into these properties, might be necessary to build four tracks through the area without constraining Alma St. This would be in addition to the impact of the raised embankment used to cross Churchill Ave.
As was described in a post about electrification, it would in principle be possible to squeeze the four-track right of way into an overall width of 75 feet, where no additional clearance exists. Whatever happens, it's a tight fit. The railroad right of way is a mere 60 feet wide alongside Peers Park. Four tracks will likely require an encroachment of at least 15 - 20 feet into Peers Park, and the removal of all the mature trees along the railroad edge of the park. Immediately after the park, the railroad right of way returns to a more generous width of 95 feet. The HSR tracks are expected to pass the California Ave. area at grade level. 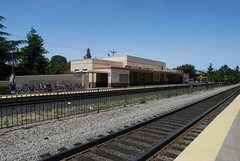 The station was recently rebuilt by Caltrain, under the $35 million Palo Alto stations project. The platforms and underpass would have to be partially demolished and rebuilt to make room for four tracks. South of California Avenue, the right of way has a width around 100 feet or more. For details, see ROW maps for mileposts 31-32, 32-33, and 33-34. 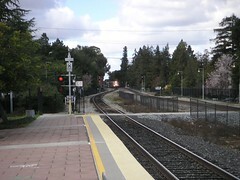 While Palo Alto has just four grade crossings that are not yet grade separated, two of them, Meadow Drive and Charleston Road, are located just 1/3 of a mile (500 m) apart at the south end of town. (see also ROW map). The CHSRA documents describe a 7 foot (2.1 m) retained embankment at this location. This would require lowering each road by 14 feet, with the consequence that the nearby intersections with Alma St. would be lowered as well. Ramps for a 7-foot embankment would need to be about 1000 feet (300 m) long on each end for operation at 125 - 150 mph. The tracks would return to grade level before San Antonio Ave.
HSR will significantly modify this profile. A detailed discussion of the vertical profile options for Palo Alto, including what can and can't be done with the tracks, is written up in the Shape of Palo Alto. Some members of the Palo Alto community have suggested putting the tracks underground through most or all of Palo Alto, removing the barrier formed by the existing tracks and opening up the former railroad land to development of housing and parks. This idea was the subject of a cover story by the Palo Alto Weekly. The proponents of the idea suggest that HSR funding might be used to build such a tunnel. However, since the benefits of the tunnel would be solely to local residents (and not to users of HSR) it is probable that Palo Alto would need to foot most of the bill for a project that promises to cost hundreds of millions, if not billions, of dollars--especially if Alma St. traffic and Caltrain continue to operate during construction. In conclusion, it will be interesting to watch Palo Alto's reaction to HSR impacts. The majority of residents voted for Proposition 1, and the city council supports HSR in principle, but the impact on affluent neighborhoods and the famed "Palo Alto Process" should make this an interesting show to watch. NOTE: This post will be updated continuously, as warranted by additional information or new events relating to Palo Alto. The comments in response to Focus on: Millbrae were quite thoughtful and identified another couple of reasonable options for reconfiguring the station for the arrival of HSR. They are labeled Option C and Option D in the expanded diagram below. After some consideration, Option D stood out to me as the least-terrible way of making lemonade out of the existing Millbrae lemon. While this is probably the best technical solution, it remains to be seen whether it is politically workable, especially because it destroys the BART cross-platform transfer, which was a huge selling point for the existing station. Then again, follow the money... the smaller station footprint and lesser impact to the neighboring development may favor Option D.
Headspans and Poles, Oh My! The High Speed Rail and Caltrain electrification projects converge on one requirement: electrification with 25 kV overhead wires. This is a standard choice around the world, easy to implement, compatible with most train types, commercial off-the-shelf, and able to handle the high power loads (many megawatts) drawn by fast trains. The photo at right is a typical sample. (credit: Vitó) Electrification is a no-brainer, so you wouldn't think it could be screwed up. Supporting the overhead wires (also known as catenary) on a 4-track electrified railroad can be done with poles, headspans or gantries. The three options are described below. 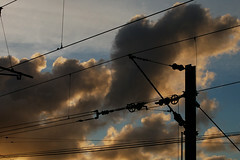 Poles (a.k.a stanchions in British parlance) are placed between pairs of tracks, and have support brackets on each side to support the catenary wires. In a four-track arrangement, the poles are placed between the inside and outside pair of tracks. Headspans are networks of steel cables hung across all four tracks, rigged from a tall pole on each side of the outside tracks. Mechanically speaking, this is somewhat analogous to a suspension bridge across the tracks. 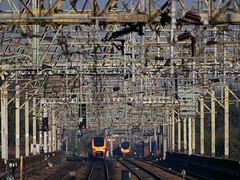 The catenary wires for each track are hung from the headspan wiring. Gantries are rigid metallic portals that span across all four tracks. Brackets are hung from the horizontal member to support the catenary wires. Each of these options has pros and cons. We'll discuss headspans first, since that is the option seemingly favored in the California High Speed Rail Authority's Bay Area EIR/EIS cross sections (Volume 2, Appendix E, Figure CC-8), as well as in the Caltrain electrification EA/Draft EIR (Chapter 2, Figure 2.3-3). A headspan is shown in the diagram at right. The dimensions shown reflect the narrowest practical 4-track headspan arrangement that complies with Federal Railroad Administration and California Public Utilities Commission requirements (assuming those requirements will not be waived). While their thin cables are somewhat easier on the eyes than other options, headspans also have several significant drawbacks. Headspans are more complicated to maintain, since the headspan cables mechanically link the overhead contact system for all four tracks. Tweaking one cable may knock another cable out of alignment; replacing an electrical isolator on one track also affects other tracks, which may need to be taken out of service. On a busy 4-track railroad, this is not desirable. Headspans are more vulnerable to pantograph failures. Rarely, pantographs (the spring-loaded metal frames on top of trains that pick up electricity from the overhead wire) fail or snag on the wiring. While there are safeguards to limit the damage from such an occurrence, the damage can be quite extensive. With a headspan configuration, a failed pantograph can damage all four tracks at once, shutting down service entirely; with a bracket support, the damage is contained on one track. This video, showing a spectacular pantograph failure, illustrates the potential problem. Headspans require very tall poles located on the outside edge of the right of way. Not only is this ugly because taller poles dwarf surrounding structures and vegetation, but it requires trees to be trimmed back further from the tracks. High voltage (50 kV) feeder wires, strung from the top of those poles, are required by the CPUC to have a minimum of 4 feet of radial clearance (General Order 95, Rule 35, Appendix E). This 4-foot high voltage keep-out zone is shaded in pink in the diagram above. On the peninsula, in places like Atherton, Burlingame or Palo Alto where large trees sometimes grow near the tracks, the outside poles and feeders that come with headspans might require more heritage trees to be cut down to build HSR. Headspans are not easily reconfigured to add tracks. They need to be built to their full width from the get-go. Given that headspans have these drawbacks, it's worth looking at the other options. Gantry frames are aesthetically the most upsetting, as the photo at right shows. (credit: polandeze) This photo is sure to be a hit with detractors of HSR on the peninsula. Gantries are not just uglier than poles because of their massive horizontal beams, but they are structural overkill in the benign conditions of the Bay Area. Gantries are typically used in situations were mechanical loads on the wires are high, horizontal spans are very wide, or vertical clearances are limited. This is exemplified by some areas of Amtrak's Northeast Corridor between New Haven, CT and Boston, MA, where the relatively recent overhead electrification is overbuilt to withstand large forces from hurricane winds and the heavy buildup of ice during winter storms. Obviously, we don't need to worry about ice storms or hurricanes here on the peninsula, and we hope the HSR and Caltrain folks won't unquestioningly emulate Amtrak. Poles keep high voltage away from the edges of the right of way, where they might interfere with surrounding objects and vegetation. The 50kV feeders are now hung above the tracks. As before, the diagram shows a pink 4-foot voltage keep-out zone, which is smaller and concentrated over the tracks, unlike headspans. Poles make it easier to build two tracks first, then add another set of outside brackets (but no additional poles) to accommodate four tracks without tearing out any of the existing electrification. This would add flexibility to the construction phasing between HSR and Caltrain electrification, enabling Caltrain to future-proof anything they might build before HSR. Poles do have one slight downside: the California Public Utilities Commission, which issued the existing clearance standards for rail infrastructure in California in 1948 (that's right, nineteen forty-eight! ), requires 8'3" clearance (2.51 m) between a pole and the center line of the track. Including 1'6" for the tensioner assemblies that hang from certain poles, that puts the minimum track spacing at 18 feet, about 3 feet more than without the poles. Nevertheless, overall width of the right of way may not increase that much because less clearance is required along the edges, where poles are not present. 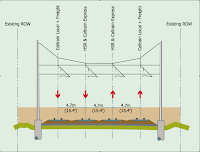 For either poles or headspans, the four-track electrified right of way running at ground level can fit within 70 feet (21.3 m), in a pinch. While the foregoing discussion is somewhat arcane, it will be quite relevant in those situations along the peninsula where the Caltrain right of way is narrowest, where HSR may cause greater community impacts and possibly eminent domain takes. San Carlos is about midway between San Francisco and San Jose. It is home to Caltrain headquarters, located just a block from the historic train depot. The depot was built in 1888 by Nathaniel Brittan, from the same stone and by the same masons as Stanford University. If the roof were made of tile rather than slate, you might think you were on The Farm. San Carlos is among the few peninsula communities where Caltrain is already fully grade-separated. The grade separations were built south to north, starting with Howard and Brittan Avenues (built 1993-95), followed by a bike / pedestrian tunnel at Arroyo Ave, a large concourse under the tracks at the San Carlos depot near San Carlos Ave, and ending with Holly St (built 1996-2000, in combination with Harbor and Ralston in Belmont). The two grade-separated tracks run on a raised berm which was opened to trains in October 1999. The Howard and Brittan overpasses sat unused for several years after they were finished, while the other projects to the north suffered delays. Due to poor construction phasing, Caltrain operated on temporary shoo-fly tracks (built on the west side of the right of way, alongside El Camino Real) for six years. Traffic and businesses were heavily disrupted by construction. One might think that after all this pain and anguish, San Carlos would enjoy the prospect of breezing through the improvements required for high speed rail. Think again! In another example of sheer incompetence, the 1990s Caltrain engineering department conceived all the San Carlos grade separations entirely without accommodation for future additional tracks, even as alarmed transit advocates tried to draw attention to this design flaw. Indeed, quite aside from HSR, the midpoint of the SF-SJ line is one of the most desirable spots to add passing tracks to allow Caltrain express trains to overtake local trains. Unfortunately, such forward-thinking transportation concepts as skip-stop express service were not yet ingrained in Caltrain's culture; the Baby Bullet had not been invented. The California High Speed Rail Authority indicates in its EIR/EIS peninsula maps that the tracks will run at "existing ground" level, with a reference to Volume 2, Appendix E, Figure CC-8, which shows four tracks running at grade. This configuration is not consistent with the existing embankment, which would more likely become a retained embankment with walls on each side. The San Carlos depot is considered a local landmark, so it will not be demolished. Built of sandstone masonry, it is not easily moved, unlike the even more historic wood frame depot in Menlo Park. The Caltrain grade separation project was built right up against it, in the manner of a thick lava flow frozen just short of the eaves. The photo to the right shows how little clearance remains, looking in the southbound direction. Note the textured concrete, strenuously trying (and failing) not to overpower the Richardson Romanesque style of the depot. The CHSRA plans a four-track station with two center express tracks. This poses a thorny engineering question: how to squeeze four tracks plus two 15-foot platforms between the depot building (to the west) and Old County Road (to the east), while constraining two of the four tracks to use the existing overpass structure alignments. Something will have to give: the depot, the overpasses, or both. The figure at right illustrates the problem by overlaying an aerial photo of the San Carlos depot with a short section of 4-track right of way (red outline) drawn to scale, using the dimensions provided by the CHSRA. Given the alternatives, perhaps moving the depot doesn't sound so bad after all. The city of San Carlos and Samtrans have plans to develop the land between El Camino Real and the tracks into a transit village. This 8.7 acre strip of land is owned by Samtrans, and was formerly occupied by the shoo-fly tracks during construction of the grade separations. The transit-oriented development was awarded to Legacy Partners after a drawn out "visioning" process that began in 2002. Samtrans will retain ownership of the land, and sign a 99-year lease with Legacy Partners. Construction is planned to begin within the next couple of years, well before HSR comes to town. A Samtrans official has claimed that the development would leave enough room to add two tracks for high speed rail, although details remain unclear. There is enough uncertainty in how exactly the two tracks will be added, given all the existing constraints, that additional physical constrains from the TOD would be unwelcome. Millbrae, by virtue of its proximity to SFO and its connection with BART, is planned as an intermediate HSR stop. The existing BART / Caltrain station is to be expanded, and is naturally the focus of the HSR project in Millbrae. Plans for the Millbrae HSR station, described in the CHSRA's environmental impact documents, call for four tracks to pass through, with two outside platforms. This is shown as Option A in Figure 1 below. To make room for four tracks, the existing southbound platform and part of the mezzanine that it supports (including the ill-placed pillars) may have to be demolished and rebuilt a few dozen feet further to the west. Millbrae is an important stop for Caltrain, ranking 5th in ridership, and even higher when counting BART. As a measure of its importance, every Baby Bullet stops there. Assuming one wanted to make Millbrae an important interchange point with HSR, it would make sense to maximize the opportunities for cross-platform transfers. Cross-platform transfers require an island platform between two tracks, allowing passengers to quickly and easily change trains on the same platform. For example, a much-touted cross-platform transfer is already possible between Caltrain and BART in the northbound direction. There are also some disadvantages. Non-stop HSR trains pass platforms at 125 mph, likely requiring a physical safety barrier. Other disadvantages depend on how this configuration is built. Two possibilities are labeled Option B and Option D, in Figure 1 below. Option B, to construct new island platforms and preserve the existing BART cross-platform access, increases the station footprint the most. The westernmost track is shifted ~60 feet to the west (vs. ~30 feet for thru configuration), with possible impact to private residences to the north and Millbrae Ave overpass to the south. As in the CHSRA's Option A, most of the station mezzanine and support columns must be reconfigured. Option D (raised in the very thoughtful comments to this post) calls for converting the westernmost BART track to use by Caltrain / HSR. The way BART is operated, with half the trains terminating at SFO, the Millbrae station is underused. The eastern BART island platform is usually closed to service. With the expected HSR and Caltrain improvements, BART has no chance of being extended past Millbrae. All of these factors support the notion of cutting the BART portion of the Millbrae station from three platform tracks to a more reasonable two. The biggest advantage of this approach is to preserve the existing mezzanine and platform configuration, without the need for large-scale demolition. The cross-platform transfer to BART (the cherry on the cake!) would be lost, in favor of better cross-platform options between HSR, Caltrain express and Caltrain local services. Option D also has the least encroachment on land to the west of the station, which may ultimately seal the deal. Constructing Option D would require some reconfiguration of the existing station, such as removing the eastern Caltrain siding track, removing the western BART tail track, reworking the BART subway portal, and probably constructing a physical barrier to separate BART from Caltrain/HSR on the adjacent track. 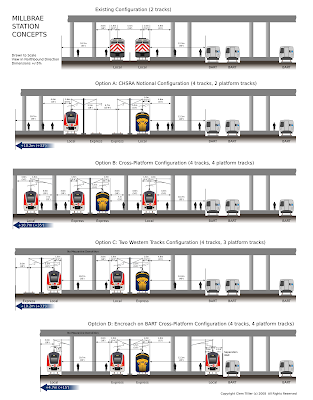 Another possibility that preserves the existing mezzanine structure is Option C, although it only provides three platform faces for HSR and Caltrain. This option involves routing two new tracks to the west of the existing station, with some of the disadvantages mentioned above. None of the options discussed here is perfect; all of them have drawbacks because of the suboptimal way the station was originally built. If the city of Millbrae, Caltrain, and the CHSRA are serious about making the Millbrae station live up to its intermodal billing, they should opt for the lesser of all evils (Figure 1 Option D), and not the design currently described in the EIS/EIR documents. While the BART cross-platform transfer (the station's political selling point) would be lost, other advantages far outweigh this loss. Whatever the final station configuration, adding two tracks to the Millbrae station will expand its footprint to the west, encroaching on an area locally known as 'Site One,' where the city of Millbrae and private developers desire to build a Transit Oriented Development. Ironically, the developers have claimed that HSR threatens to derail their TOD plans, quite shamelessly undermining their claim to be "Transit Oriented." The people who run Caltrain appear to have capitulated prematurely by promising the developers that HSR can be accommodated within the existing station footprint, an option that even the CHSRA doesn't try to pass off as feasible. The CHSRA has also penciled in another parking structure for 230-400 cars to the west of the station on Site One, apparently without regard to the existing under-utilized 3,000 space BART parking structure, which has plenty of surrounding land for expansion. Most road crossings in Millbrae are already grade separated. A separation at Center St, at the entrance to Marina Vista, remains to be built. This is a constrained location where the BART tunnel box runs immediately to the east of the crossing, which prevents lowering the road. The BART to SFO project (which, as built, is much better described as BART to Millbrae) was brought to you by Quentin Kopp, who is now chairman of the High Speed Rail Authority. While Kopp has clearly established a track record in bringing large transportation projects to fruition, his BART extension shows all the signs of having satisfied not just a transportation need, but the raw urge to pour way more concrete than strictly necessary. A lot of this concrete was poured on, under, and around the Caltrain right of way, constraining it in various unpleasant ways that will come back to bite us (the taxpayer) as HSR is built. The botched Millbrae station discussed above is only the tip of the iceberg. The construction companies won't mind: there's real money to be made in jackhammering old concrete to make room for new concrete. According to the CHSRA's environmental impact report Appendix 2D for the Caltrain Corridor, the HSR tracks will run through Millbrae at grade, right next to the BART tracks. But after BART was built so expansively into the Caltrain right of way, there isn't a lot of room left to build another pair of tracks. For example, take a look here and here, and think about how to fit in the planned 100-foot, 4-track right of way as shown at left. NOTE: This post will be updated continuously, as warranted by additional information or new events relating to Millbrae. Last updated 09 December 2008.